Info "That kid's face is filthy! Wipe it off!" 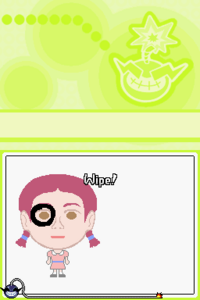 Washed Up is a microgame found in the Dance Club Rub stage in WarioWare: Touched! The objective of the game is to rub the mess off of the kid's face. 1st level difficulty: There is one spot on the kid's face. 2nd level difficulty: There are two spots on the kid's face who moves a bit. 3rd level difficulty: There are two spots, and the kid starts moving around. French Propres sur eux Literally "Clean on them", pun on the expression "propre à _" (meaning "unique to a person/group"). This page was last edited on October 16, 2018, at 22:59.